Doctor Who: "Victory Of The Daleks"
And so, inevitably, the Daleks. Written by Mark Gatiss—the League Of Gentlemen veteran who’s contributed to the series since its revival—“Victory Of The Daleks” reintroduces the Doctor’s greatest enemies—his “archenemies,” to borrow Amy’s term—for Matt Smith’s new Doctor. It’s a cleverly plotted episode, but one that feels too busy taking care of business to really breathe on its own. We need to meet the Daleks, learn how they survived, figure out where they’re going, then close curtain and be done with it. Which we do, with a little time left over for Winston Churchill and a heartwarming sub-plot about a Scottish inventor who’s not quite what he seems. That’s enough to make for a satisfying episode, albeit not an extraordinary one. But still, definitely satisfying. Any episode set in London during the Blitz courts comparison to Steven Moffat’s first Who episodes, the two part “The Empty Child”/“The Doctor Dances.” “Victory Of The Daleks” can’t help but look smaller by comparison, but it finds its own angle on the time, even if it’s a slightly jarring one. 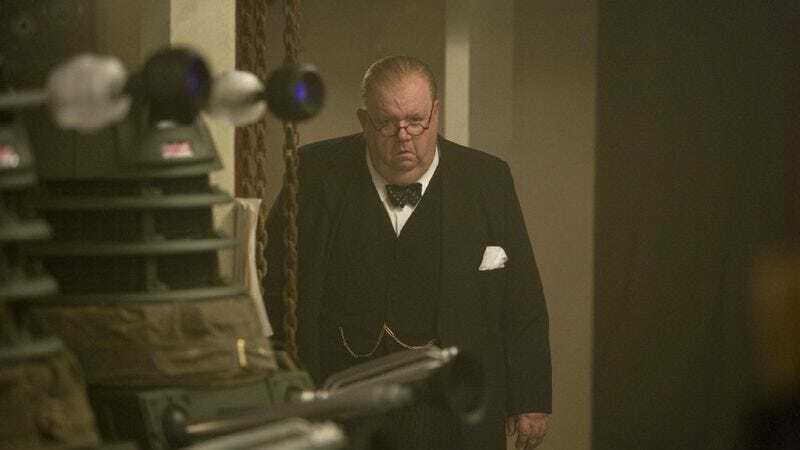 We’re deep in the war room for much of the episode, where some of the members Women's Auxiliary Air Force lose loved ones and the episode doesn’t dwell on it too much in favor of Ian McNeice’s strangely spritely Winston Churchill. I just assumed that McNeice had played Churchill before, but apparently this is first time picking up the big cigar. (UPDATE: On screen at least. A reader informs me he played Churchill on stage in the 2008 play Never So Good.) He’s fun, but his borderline giddiness in the face of the Blitz struck me as a little improbable, even for a show that knows the value of keeping a light touch. Tonal issues aside, there’s a lot to like here, starting with the ingenious notion that the Daleks, who look like they might have been assembled from WWII-era scrap material, fighting the good fight in Britain’s darkest hour. (Sorry. Not Daleks. “Ironsides.”) Is there anything funnier than the usually peevish aliens asking “Would you care for some tea?” in that awful, awful voice? I liked the way the plot unfolded, too. At first I assumed that Bracewell, played by British TV veteran Bill Paterson, was simply a duplicitous dupe for the Daleks and was surprised by the reveal that he’d been fashioned as part of the master plan. Also clever: the Daleks tricking the Doctor into identifying them and thus perpetuation a new wave of Daleks. So about those “new paradigm” Daleks: How does everyone else feel? I’ve always kind of liked that the show kept the Daleks unchanged from the classic years, but as someone who jumped on in the Davies era, I also don’t have much sentimental attachment to the old paradigm Daleks. Not that these bigger, sleeker Daleks radically depart from the old design. But there was always something weirdly effective about the Doctor staring down at a clunky-looking bad guy who nonetheless had unfathomable powers of destruction. That gets lost with these looming metal threats, but they’re still unmistakably Daleks. As for the climactic scene, I’m not sure how the science of defusing a Scottish-scientist-who’s-actually-a-living-bomb worked, but I thought the scene worked. Karen Gillian brings a flirty desperation to a moment that once again proves Amy’s usefulness to the Doctor’s adventures. (Best line reading, and one suggestive beyond the current spot she was in: ““Ever fancied someone you knew you shouldn’t? It hurts, donnit? But kind of a good hurt.”) Then, after a little bit more comical business with Churchill, we’re off. But what’s that little rip in the fabric of time doing in the background… again? • This is two episodes in a row that required the Doctor to make an impossible choice—here destroying the Daleks or destroying the Earth—and draw out the tension to the breaking point. Will that be a defining device for this run? 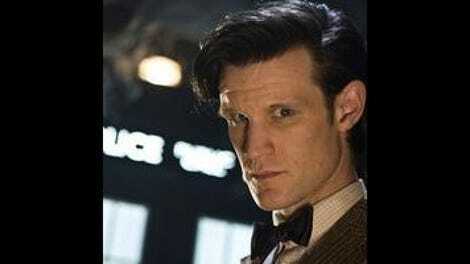 Doctor Who: "The Beast Below"
Doctor Who: "The Eleventh Hour"